AILET counselling 2018 process will be started on 25 June2018. The final step towards admission is AILET counselling. AILET 2018 Exam sees approximately 20,000 applicants each year and these applicants vie for 83 seats in AILET seat allotment in NLU Delhi. This means there is so much competition that for every seat in AILET seat allotment there are more than 200 contenders. Out of the total of 83 seats there is a reservation such that only 52 seats are for general students, 11 for SC candidates, 5 for ST category, persons with disability have 2 seats reserved for them, 2 seats are for students from J&K and 1 seat for Kashmiri migrants and finally there are last ten seats which are for foreign nationals. 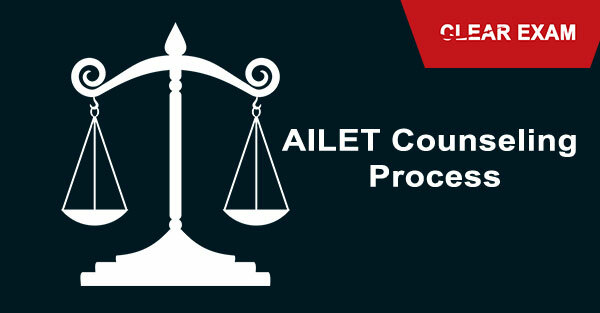 Foreign nationals do not have to appear for the AILET exam and their seats are filled by direct admission and not by AILET exam and AILET counseling whereas all other students have to appear for the law entrance exam, and then if they clear the exam for AILET counseling 2018 if their rank is above the cut off rank. The first step in the AILET counselling 2018 process will be downloading the merit list and seeing if you have your name there. If the name appears in the merit list then you will be sent an admission letter during the fourth week of May 2018 whereby you will be informed that you have been selected to attend AILET counselling and AILET seat allotment. Once you get the letter then you have to pay the AILET counselling fee and once payment is confirmed you will be called for offline AILET counselling 2018 which means that you have to be present at the venue at time and date assigned for the counselling. Payment has to be made before the last date which is sometime in the second week of June. You must carry with you the following documents for they will be verified at counselling time. Failure to reach the venue at given time and date, failure to pay or attending the AILET counselling without documents will render your admission and candidature cancelled. If you are selected after the document verification then you are allotted a seat, and for all seats still left vacant there will be spot counselling on June 25,2018. Those who have false documents will be disqualified immediately. Spot counselling is done to give admissions to all those who have qualified the AILET exam, earned a merit rank and no further discussions will take place once spot counselling round is done. That brings us to an end of seat allocation and counselling rules. Candidates can read the post to know on AILET counseling 2018 including the counseling process, seat allotment and admission dates.